Europe for Cruisers is part of Europe for Visitors, a Forbes and Washington Post "Best of the Web" editorial travel-planning site that has offered unbiased advice to millions of travelers for 16 years. We focus exclusively on European cruising, with in-depth ship reviews and information on ocean, river, and barge cruise lines in Europe. 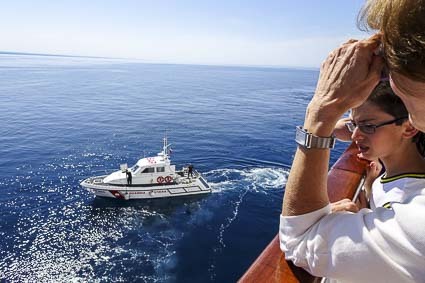 ABOVE: An Italian Coast Guard vessel returns to Bari from NCL's Norwegian Jade after evacuating a sick passenger. More than 50 cruise lines cater to English-speaking travelers on Europe's oceans and inland waterways. Our illustrated descriptions include links to the cruise lines' Web sites. Read our in-depth reports on ocean and river cruises. Also see Tour Europe by Ship, which discusses "port-intensive" cruising as an alternative to cars, trains, and coaches. Explore Europe's inland waterways on a hotel barge or narrowboat. The pace is slow, the atmosphere is cozy and informal, and you'll avoid crowds even during high season. Also see our article on Coastal, Canal, and River Cruises in Britain. If your cruise begins or ends in Venice, Italy, read our port information at Venice for Visitors. Also see "Roundtrip Cruises from Venice," our 35 pages about Rome's cruise port of Civitavecchia, and our guide to Paris River Cruise Ports.